Sensitivity: 89 dB SPL, 1 W, 1 m (3.3 ft). High power handling (175 W pink noise) with integral protection circuit network. Molded enclosure with shielded magnet structure. Components: •165 mm (6.5 in) low frequency loudspeaker. •25 mm (1 in) pure titanium dome tweeter. Optional mounting hardware available in two colors: black and white. 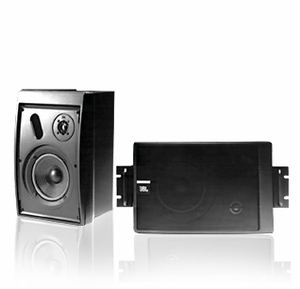 MTC-51 Wall Mount Bracket: Allows the Control 5 to be mounted to any rigid vertical surface with a unique polymer ball and clamp design, In addition to omnidirectional movement about the ball, the speaker’s connecting wires may be run internal to the clamp. Optional colors.